The heart of our farm is grass. When we purchased Open Book Farm in 2015, all arable land was in a conventional corn and soy rotation. Since then, we have planted 50 acres into permanent, certified organic pasture, with plans for more in the coming years. Pasture not only provides a natural environment and feed source for our steers, pigs, chickens, and turkeys, but, when managed through rotational grazing, grass has been proven to actively sequester atmospheric carbon. Our commitment to building soil organic matter extends into our greenhouses, where we have moved to a completely "no till" bed prep system. Tillage, though ideal for swiftly creating a fluffy, uniform planting surface, is detrimental to the long term health of soil--it leads to rapid organic matter breakdown and disrupts the networks of beneficial microryza and fungi that feed plant root systems. We have found that our permanent, deeply composted beds yield excellent produce year round, and we have developed systems to transition between crops without the aid of a rototiller. As an added bonus, our no till system is reducing the weed bank in our tunnel and greenhouse. Apex predators like coyotes, hawks, and bald eagles can spell disaster for pasture-based farms. We have all three. That said, we believe that they serve an important role in the larger ecosystem, by helping to keep prey species (moles, voles, and groundhogs) from exceeding healthy population limits. And, frankly, as vegetable farmers as well, we're not big fans of the small furry vegetarians! Our livestock guard dogs, Patou and Meryl, are one tool in our "predator-friendly farming" practice (electric fencing and secure range coops are also important). LGD breeds have been selected for millennia for their strong guarding instinct and minimal predatory drive(predator drive+chickens=ineffective guard dog) Besides helping to keep the poultry safe, Patou and Meryl on occasion stand vegetable guard duty (to deter deer), and they are always happy to receive thanks in the form of head scratches or hardboiled eggs. 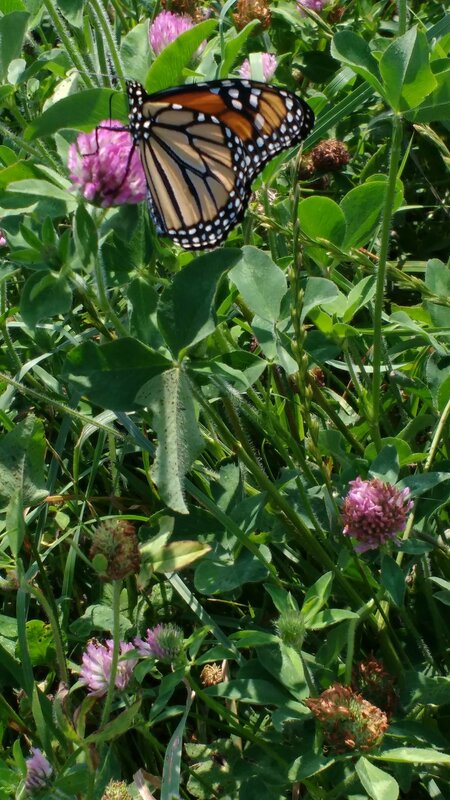 Our pastures support a wide diversity of grasses, legumes, and forbs (broad-leafed weeds) which, in aggregate, provide an excellent home for many native and migratory pollinators. We believe that a biodiverse system is more resilient than monoculture, and we strive to create the conditions to support a wide range of insect and bird life. At Open Book Farm, native beneficial insects have space to overwinter and can rebound quickly in the spring to fight pest insects. Birds enjoy the riparian tree buffers we've planted near our springs and streams, and we enjoy farming to the accompaniment of birdsong. Farmland, properly managed, is an enormous asset in the ongoing struggle to restore the Chesapeake Bay. Our pastures and riparian tree plantings all act as filters for our region's water. We recognize that animal waste products are valuable sources of fertility, but must be managed to prevent overload and runoff into the Bay. Rotational grazing allows us to fertilize our pastures naturally and appropriately, without sending Nitrogen, Phosphorus or sediment into the Bay. As poultry processors, we generate a considerable amount of offal each week of our processing season. Rather than viewing these feathers, blood, and viscera as waste products, we compost them with wood chips, thereby sequestering the valuable nutrients and minimizing run-off into the Chesapeake watershed. Our processing compost is used to fertilize our pastures. We brood our chicks on peat most bedding for the first three weeks of their lives. In the fall we clean out the brooders and compost this material separately to create a premium finished compost for our vegetable garden.